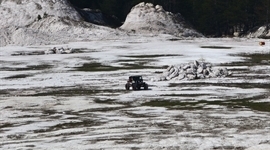 Bulgaria Offroad Competitions - News - THE TROPHY TRACKS ARE ALMOST READY ! THE TROPHY TRACKS ARE ALMOST READY ! The Orga Team of “Trophy Kardjali 4x4”is almost ready with the tracks. Very interesting roads, many navigation and azimuths, variety of terrains with rocks, mud, hill climbing and downhill await the competitors from Bulgaria, Greece, Romania, Turkey and Serbia. Do not miss, be prepared!